Besides Haman, there are two important villains in the Purim story who are sometimes overlooked. They are critical players, because without them, Mordechai could not have risen to prominence and Esther would not have been able to use her influence with King Achasverous to save her people. Their names were Bigthan and Teresh, and they have since been compared to Shakespeare’s Rosencrantz and Guildenstern, two characters from “Hamlet,” who help move along the story. 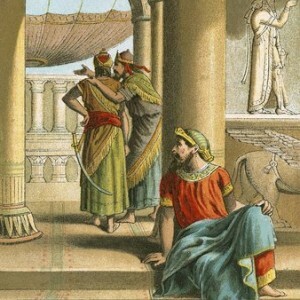 Bigthan and Teresh were courtiers to King Achasverous who Mordechai caught conspiring to kill him. When Mordechai overheard their plot he reported it to Queen Esther. 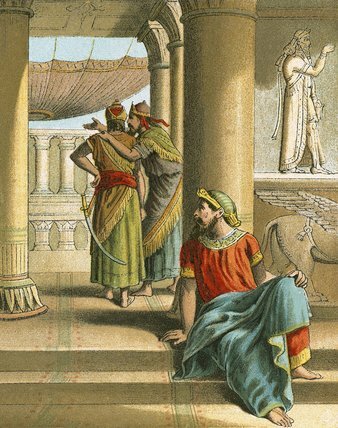 Esther told the King and the two would-be assassins were killed. Mordechai’s role in unraveling the conspiracy was written down in the royal logs and the incident passed, for the time being, as if forgotten. However, Mordechai’s intervention was critical to Haman’s eventual downfall. One night, after some time had passed, the King’s sleep was restless. To fall asleep, the King asked a servant to read from the Book of Chronicles, the royal logs that recorded daily events. It just so happened that the entry read to him was about Mordechai’s loyalty to the King. When the King was told that Mordechai was never rewarded, Achasverous honored Mordechai with a royal procession, complete with royal robes and the King’s own horse. Haman, to his horror, was made to lead Mordechai through the streets of Shushan, the capitol. Over the next couple of days, Esther finally revealed her Jewish identity and exposed Haman’s plot to destroy the Jews. The King gave permission for the Jews to defend themselves and ordered Haman and his sons hanged. Mordechai & Queen Esther: The story of Queen Esther, her bravery and beauty, has been the stuff of legends for centuries. Ask any little girl what she wants to be on Purim, and the answer almost always is Queen Esther. Her story reads like a fairy tale. A Jewish orphan girl grows up and by a chance of fate, is plucked from obscurity to become Queen of Persia. But it wasn’t just fate, and if you take a closer look, it wasn’t much of a fairy tale. Esther, or in Hebrew, Hadassah, found herself and her people in grave, mortal danger. Esther is a heroine for all time because she summoned the courage to act in a way that threatened her personal security and comfort. With the help of her uncle Mordechai, she overcame her fear, set a clever trap for Haman, and when the time was right, revealed her religion and in so doing, saved her entire people. “For who knows, if not for this purpose alone were you placed in the King’s palace,” Mordechai told her. Nothing happens by sheer coincidence. Even Mordechai realized that it wasn’t just chance that placed Esther in a position to save her people. He must also have realized that it wasn’t just luck that caused him to overhear Bigthan and Teresh’s assassination plot against the King. The war of world’s in Persia was in essence a continuation of the ancient hatred of the Amalekite kingdom against the Israelites. This time it was Haman, a direct descendent of King Agag verses Mordechai and Esther, descendants of King Saul, whose cosmic error in judgment spared the life of king Agag, otherwise the last survivor of the evil Amalekites. And in a final twist of irony, it was Esther’s own grandson, King Cyrus, who allowed the Jews to return to Jerusalem to rebuild the second holy temple, thus completing the cycle of persecution to redemption.